Welcome to Cross Wires, the new Scottish Catholic Observer newspaper blog. Cross Wires aims to shine a light on the key issues and breaking news between weekly editions of the SCO so look in regularly for updates. You will find facts, opinion, analysis and plenty of food for thought. THE general election is most certainly on and the gloves are most definitely off. Not one, not two, but in fact three government ministers have let ‘slip’ that voters are likely to be going to the polls on May 6, with Defence Secretary Bob Ainsworth the latest MP to add fuel to the fire on when the general election will be called. Church leaders in Scotland and of members of the Scottish Clergy against Nuclear Armaments (SCANA) are calling for the future of nuclear weapons to be at the heart of the general election campaign. And it is amazing what else comes out of the woodwork in a general election year. In the House of Lords an 11th hour amendment protected the Catholic Church’s recruitment policy from government equality legislation. In the Commons a parliamentary committee advised that anti-Catholic rules governing royal marriages and the succession to the throne of the UK breach the European Convention on Human Rights. Now in Scotland, a group of SNP MPs have called for former Prime Minister Tony Blair to be tried in a Scottish court for his decision to take the country to war in Iraq, not the International Criminal Court at the Hague. It cannot be stressed enough that the issues that come to the fore over the next few months are probably for obvious political ends rather than on their own merits as political parties canvas for votes. In the midst of the smoke and mirrors it will get difficult not to lose sight of the fact that the MPs we elect this year, if left unchallenged, may only reveal their true colours after they are elected, not before. The issues that really matter to Catholics must be raised now. Although recent press reports on the Pope’s visit to Scotland are still officially unconfirmed There is increasingly a “buzz about the place” at the prospect of a papal visit. That excitement shouldn’t be confined to Catholics either. If you look at the other countries that have visited by Pope Benedict during his Pontificate, they are countries like America, Brazil and Australia. Countries that are huge players on the world stage with vast Catholic populations. The fact that the Pontiff is even considering coming to Scotland is a sign that this country still punches above it’s weight in terms of influence and has much to offer the world. Further it’s important to remember that Pope Benedict is not just the leader of the Holy Roman Catholic Church. He is also a world class mind, a theologian of rare and profound thought, and a most astute observer of modern society. If he does come to Scotland it will be fascinating to hear what he has to say. WELL it didn’t take long did it? Before the dust had even settled in the House of Lords (and aren’t suggesting there is a great deal of it, that debate is for a different day), the backlash began over Lady O’Cathain’s amendment to the Equality Bill. “‘Religious freedom’ seems to give these Christians an absolute right to ignore the law if they dislike it. The bishops were particularly culpable on this,” bellows Terry Sanderson in The Guardian. He was, after all, elected as president of the National Secular Society in 2006. Not all Christian, we are told, or people of faith are united in celebrating the victory of common sense to allow churches to retain control over their hiring policies and ensure the people who work for them share their values. The SCO says that our duty to protect the institutions that enshrine our moral and Christian values supercedes any obligation to the EU as a member state. The creeping erosion of these values cannot go unchecked. And, again, we wait to see what the Commons will do. Will Commons sense prevail over equality? PEERS have voted down the government’s equality bill in a bold move that will protect religious organisations including the Catholic Church. The Lords have voted 216 to 178 in favour of an amendment proposed by Lady O’Cathain to keep the current law that allow religious organisations to employ people whose lifestyles are consistent with their doctrinal beliefs. The government had tried to amend Harriet Harman’s Equality Bill so that exemptions applied only to those whose jobs ‘wholly or mainly’ involved taking part in services or rituals, or explaining the doctrines of religion. Lords leader Baroness Royall said that ‘the government’s intention is not, and never has been, to narrow the scope of the exception.’ However Church leaders feared that if the bill had been passed unamended it would have left them vulnerable to legal challenges. It is not known as yet whether the government will attempt to overturn the defeat in the House of Commons. The best case scenario would be if Commons sense prevails and MPs accept the wisdom of the Lords on this issue. IT IS not everyday that a new newspaper title is launched in Scotland. 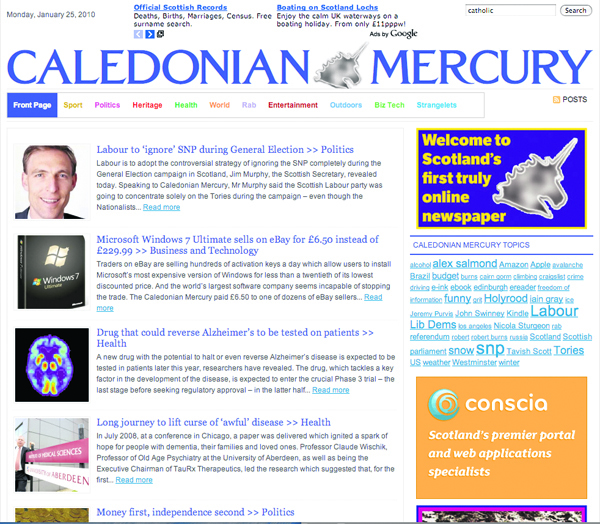 In a sector where shrinkage and closure are rapidly becoming the norm, how refreshing that Caledonian Mercury editor Stewart Kirkpatrick has made the bold and welcome move of launching the first web-only national newspaper today. Electronic media remains fickle, however, with the Mercury’s launch leaked by an unfortunate and unintentional Twitter bulletin last night. Good job then that former Scotsman online editor Mr Kirkpatrick and company plan a quarterly print version. In the hope that the online newspaper will go from strength to strength, the SCO offers some food for thought. It may only be day one of the new title but if you enter the word ‘Catholic’ in the Mercury’s search engine there are no hits. In what we hope will be a Papal visit year, perhaps this also is nothing more than a temporary glitch. Margo MacDonald has finally unveiled her Assisted Suicide Bill at the Scottish Parliament. Make no mistake, this represents profound assault on the culture of life in this country. You can expect the Scottish Catholic Observer to have a strong report and response in next week’s edition. It is also no surprise to see the secular press welcoming Ms MacDonald’s proposals with open arms. Across the board newspapers and TV stations have accepted Ms MacDonald’s framing of the debate by presenting her bill as merely intended to offer ‘choice’ to the seriously ill. This shows Ms MacDonald’s astuteness as a politician. We live in an age where choice is held up as a prime value. Choice for customers, choice for parents, choice for all. Rarely do we hear about the rights and responsibilities we have as members of society. Instead of obsessing over choice, what about the right to life? What about our responsibility to care for the terminally-ill without rushing them off to an early grave? It is vital that all Catholics oppose Margo MacDonald’s bill. RESCUE attempts in Haiti continue in spite of a second earthquake hitting this morning, and people are still being found alive in the rubble eight days after the first disaster struck. Early reports, however, indicate today’s earthquake could hinder aid efforts on the island that are well underway after last week’s 7.0 quake. The desperate appeal to help seminarians on the island that came from Archbishop Louis Kebreau of Cap-Haitien, chairman of the Haiti Catholic Bishops’ Conference, has been answered by Aid to the Church in Need. The charity is sending £61,000 to help more than 200 destitute seminarians in Haiti after their college collapsed in the earthquake. The urgent aid, being sent from ACN’s UK office, comes after news that at least 30 students for the priesthood were confirmed dead after being crushed when the quake destroyed seminary buildings in the capital, Port-au-Prince. 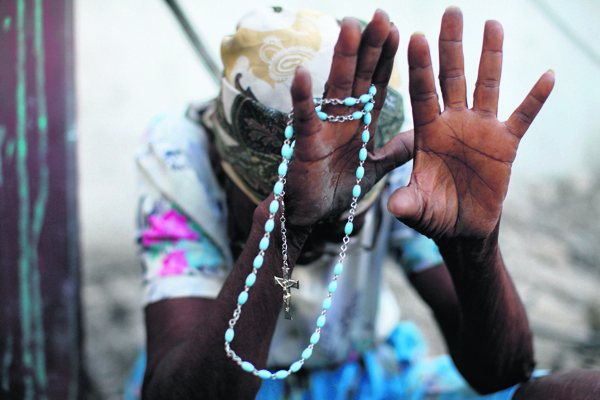 Salesian Archbishop Kebreau stressed the plight of the seminarians following the earthquake, saying that they had nobody to care for them and were desperate to return to their home dioceses, in many cases many miles away from Port-au-Prince. Will justice be done at the EU? EU JUSTICE commissioner-designate Viviane Reding is waiting, along with the other nominees for the 26 EU commissioners positions, for a confirmation vote that will decide her future. She has been questioned by MEPs and has a strong support base but faces a hidden hurdle ahead of the vote on next Tuesday–her Catholic Faith. Her pedigree is impeccable. 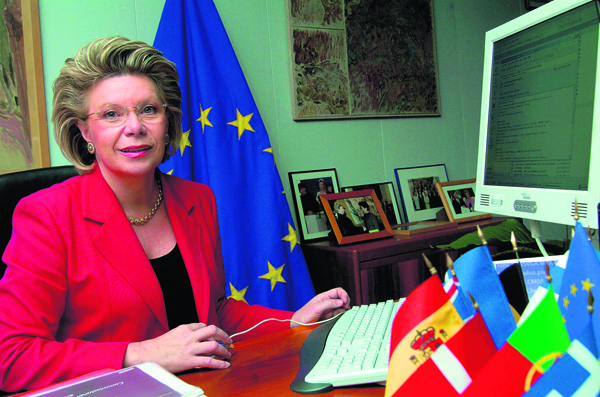 Born in Luxembourg, she is currently finishing her term as European Commissioner for information society and media. She also served as commissioner for education and culture under the presidency of Romano Prodi from 1999 to 2004. In spite of her qualifications, however, it appears her religious beliefs remain an impediment that may prevent her from serving as Commissioner of Justice, Fundamental Rights and Citizenship. Mr Buttiglione, an Italian, failed to in the post of commissioner for justice, freedom and security in 2004 because he defended a traditional definition of marriage and took a stance against promoting homosexuality. The suggestion that Catholic cannot be justice commissioner is offensive and smacks of discrimination. The question remains, will justice be seen to be done? Can we get our act together? THE campaign by Liberal Democrat MP Evan Harris to end discrimination against Catholics as enshrined in the Act of Settlement may be a step closer to success today but it still does not go far enough. The Joint Committee on Human Rights (JCHR) has ruled that laws barring members of the Royal Family from marrying Catholics breach the European Convention on Human Rights. Mr Harris’s proposed reform of the act has received cross-party backing in a report on the Government’s Constitutional Reform and Governance Bill. As Bishop Joseph Devine of Motherwell has pointed out on more than one occasion, however, only the immediate repeal of the act can right the wrong against Catholics enshrined in British law. In Scotland, where sectarianism is known as the nation’s ‘shame’, the act is seen as legitimising anti-Catholic prejudice. In this general election year, isn’t it time someone listened to the call for radical change throughout the Commonwealth, no matter how costly and time consuming, instead of token reform of this anti-Catholic act? LATIN songstress Shakira refuses to feel guilty about her spending habits, claiming shopping boosts the global economy. So, if the Scottish stereotype is true, with this confirmation of willingness to part with her cash it’s official, Shakira is not one of us. However it is a pity that this role model for young women was not in Edinburgh at the weekend to hear the advice of another Latin American role model. Herman Rosa Chavez, El Salvador’s minister for the environment, spoke on Sunday at Lauriston Jesuit Centre on climate change as a ‘moral issue’ and of the need for a global ‘adaptation agenda’ for development. Not quite as catchy as the She-wolf’s refrain but, dare we say it, the minister’s words have a little more substance. You are currently browsing the Cross Wires blog archives for January, 2010.